Undercover senses that one of the perceived drawbacks about tents of all types is the need for a long and involved process simply in order to get everything properly et up for use. 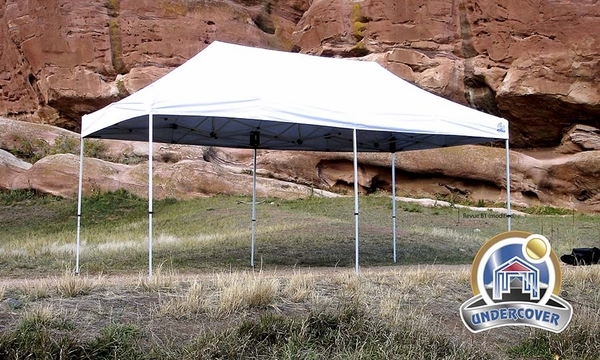 With their Commercial Aluminum Popup Shade Canopy Package with White Top, they have managed to develop a product that can be set up relatively quickly with just two people, as well as has been specially fabricated to insure that everyone is properly shielded from almost every UV ray that passes their way. Please be aware that this canopy must be securely anchored at all times and is not intended for permanent setup applications. It should not be left unattended for extended time periods, as water can pocket in certain inclement weather conditions. Folds To: 62" x 12" x 16"
Is there a bracket of some kind that I can screw into a deck versus staking it into the ground? I want to cover a wood deck. Unfortunately, only gravity tubes and a stake kit are available for anchoring this canopy. 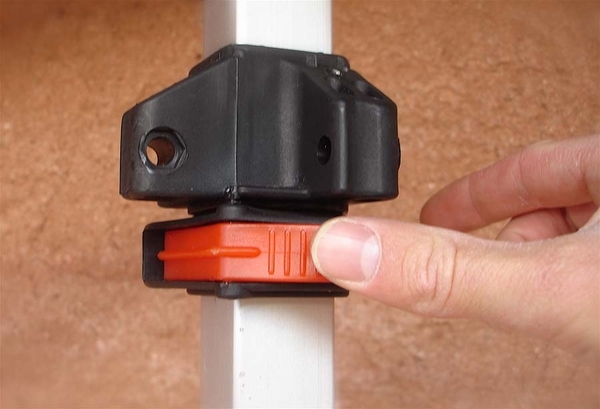 The base plate is plastic, so you can put a screw through it into your deck. Are there sides available to purchase for this item, and does it have Velcro on it to attach the sides? You would buy two sets of Undercover 10 Foot Zippered Poly Sidewalls. They do attach with Velcro. 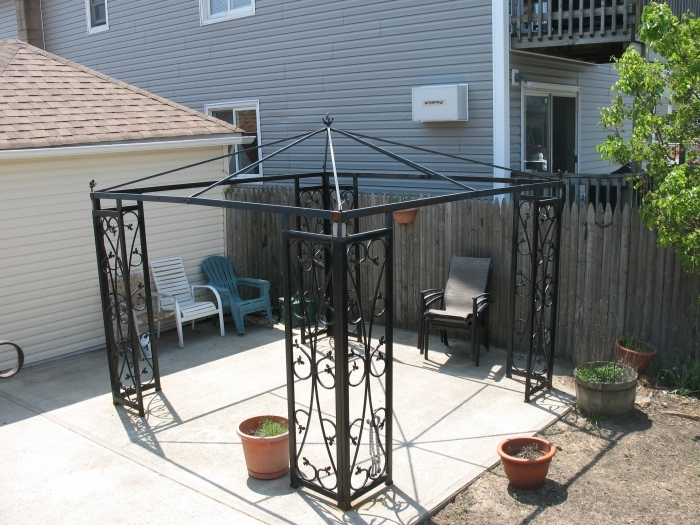 Can I use this canopy cover on my old gazebo frame? We do not sell this type of frame, so we cannot guarantee the fit of our replacement covers. We suggest contacting the manufacturer of the frame you own for the appropriate cover. Are there any colors available other than white? Are side wall available for the 10' X 20' canopy? 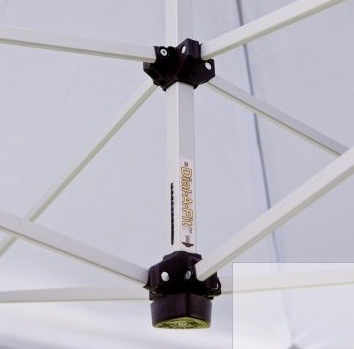 These canopies are only available in white. There are no 20 foot side walls available. You would need to purchase two sets of the 10 foot walls. Does this tent have a NFPA701 Fire Certification? Will there be a fire code tag sewn into the cover? 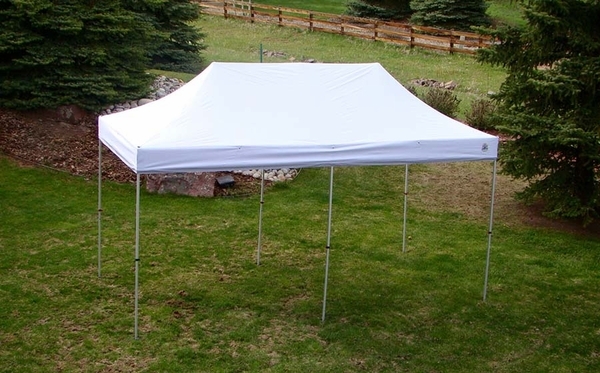 This tent is NFPA701 Fire Certified; however the tag is not sewn into the tent. 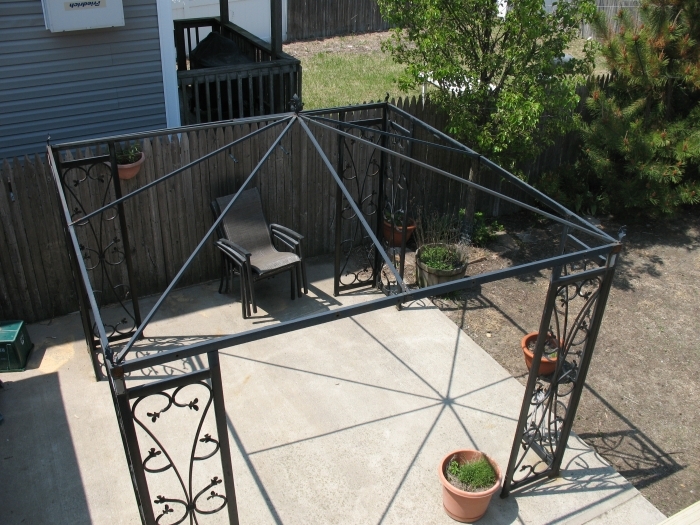 I purchased this canopy and let me tell you, it's quite beautiful however its quality is very cheap. I used this canopy twice and on the second time with a little wind the legs broke. this is with the anchors in the ground for support. I would not recommend this canopy to anyone. Spend the extra cash and get a commercial canopy. Easy to assemble and use. Provides excellent cover for BBQ cook offs and parties. Easy set up. I had put this up on my deck for a party three weeks ago. We thought we'd leave it up a few days and it's been up for 3 weeks. Shade and water repellent through a few rain storms, we know we have to take down soon but we are enjoying it. Originally purchased for use on the beach this summer. My oldest son got Baptized and we had a brunch afterwards. I set the Canopy up in the back yard and it was excellent. Plenty of room, easy to put up and take down, and good quality. I am very pleased with the canopy. Two people can easily put the canopy up and take the canopy down with very little effort. ProsThere are no poles to deal with in putting the canopy up and taking it down. It is a one piece unit. ConsThe color........while will be hard to keep clean. Great tent! Used it for an activity. It was wonderful and easy to set up and to take down. It was also very aesthetically pleasing and I received loads of compliments from my guest. The frame is lightweight and manageable for even one person to adjust once fully expanded. It is definitely a two person set up though. Once my activity was over, it took me less than five minutes to put away the tent and store it in the protective case. The case also is fabulous with it wheels on the bottom to make that much easier to move and store until my next event. Pros- great set up, light weight and seems to be made out of durable material. Cons- haven't come across any for now, too new to tell. Light weight but sturdy and nice size.Four people to set up is ideal. ProsOnly used once in light rain. Worked great. As soon as I received the canopy my wife and I and our son sat it up in our shop. even though in was on a smooth concrete floor, and being very careful not to harm the unit, the frame braces bent so much I feared they would break. Easy to put up, and take down. Provided our deck with lots of needed shade for a High School graduation party. We were going to rent a tent for our son's graduation. We purchased this tent instead. It was just slightly more expensive. We have already used it three times in the last month. It is so easy to set up and it looks wonderful. We also enjoy the rolling case-makes transporting a breeze. I purchased this canopy for an event of 14 people. I used two 6 foot tables which fit perfectly under the tent, leaving plenty of room on each side. The canopy was super easy to assemble. We used one person at each corner to pop it up but I believe it may be possible to just use two. The breakdown was a snap and it came with a large wheel canvas bag for storage. I am very pleased with my purchase! 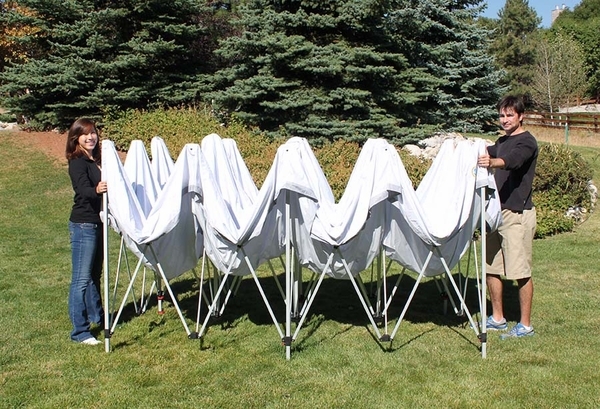 We use the quick set-up canopies for our regular weekend street ministry church outreach. Our set-ups are on paved parking lots or grassy fields (rain or shine). The cool rocker-switch type corner and leg levers help with easy deployment and take-down. 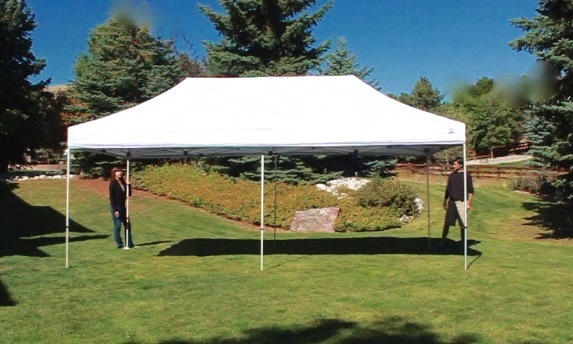 10' x 20' size provides good coverage for everything we need to do under the sun or in the rain. ProsEasy to Transport Nice Features Love the Leg Covers Elegant Looking Structure Frame only weighs 40 pounds !! !